Liquidity’s Hydrating Toner is formulated with high quality Aloe Vera gel and other special ingredients, which help to hydrate,soothe, refresh, restore natural pH, nourish, energize and tone the skin. Liquidity’s Hydrating Toner helps to remove any last trace of cleanser that might be left on the skin after cleansing. The Toner may also be used periodically during the day to refresh the skin. The refreshing smell in the Toner is created from the essential oil of Sage. No alcohol is present and no animal testing is used with the product. Liquidity's Hydrating Toner helps to remove any last trace of cleanser that might be left on the skin after cleansing. The Toner may also be used periodically during the day to refresh the skin. The refreshing smell in the Toner is created from the essential oil of Sage. No alcohol is present and no animal testing is used with the product. 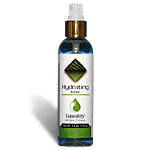 For maximum benefits, apply the Hydrating Toner after cleansing the skin with Liquidity's Hydrating Cleanser. Women may prefer Appling Liquidity's Hydrating Toner with a cotton puff or men may prefer to apply like an after shave by sprinkling Toner into hand and patting onto the skin. Purified Water - Water is essential to the skin. Water is a natural cleanser and helps to hydrate the skin. The water used in Liquidity's products is purified and filtered by a reverse osmosis process. Aloe Vera Gel - Since ancient times Aloe Vera gel has been used as a natural cleanser and moisturizer. The molecular structure allows Aloe Vera to penetrate the skin, supplying moisture directly to the tissue. Other properties include moisture regulation and an apparent ability to absorb UV light. It has a slightly relaxing effect on the skin, making it beneficial for sensitive, sunburned, and sun exposed skins. Sodium PCA (Ajidew NaPCA) - A high performance humectant due to its moisture-binding ability. It is derived from amino acids. Sodium PCA is considered noncomedogenic and nonallergenic and it is recommended for dry, delicate, and sensitive skins. Soluble Collagen - Its great hydration potential has the amazing ability to bind and retain many times its weight in water. This water binding and retention ability makes collagen effective as a protecting agent. As a film former, collagen aids in reducing natural moisture loss, thereby helping hydrate the skin. Butylene Glycol (and) Panax Ginseng Root Extract - These two ingredients are helpmates to each other. The Butylene Glycol has antimicrobial action and when blended with the Panax Ginseng Root Extract. When combined the two help with special benefits such as diminishing wrinkles and relieving dry skin. The active components of the Ginseng's root include; ginsenosides and are said to be responsible for the revitalization and reactivation of epidermal cells. Important constituents include saponins, mucin, vitamin B, and ginsenoside. Panthenol(Vitamin B-5) - Panthenol appears to stimulate cellular proliferation and aid in tissue repair. The Vitamin B-5 in Panthenol helps to impart a nonirritant; nonsensitizing, moisturizing, and conditioning feel and may help promote normal keratinization. Panthenol helps to protect the skin against sunburn and provides relief for existing sunburn. Its humectant character enables it to hold water in the product or attract water from the environment, resulting in a moisturizing effect. As a skin softener it provides suppleness. It is considered noncomedogenic. Allantoin - Found in the Comfrey Root this ingredient is believed to help in the aid of healing damaged skin by stimulating new tissue growth. Salvia Officinals (Sage) Oil - Obtained by distillation of sage leaves and flowers. The essential oil adds the natural aroma to the Hydrating Toner.